November was a great month for the Steamboat Springs real estate market, up quite a bit over last year’s November. (90%) Gross volume in November came in at $51,948,300, and had a total of 125 Transactions. This big shot in the arm leaves your YTD, Gross volume slightly off last YTD, but under -10%. Transaction wise, November was strong with 125 transactions, although general transaction numbers are still down. There was strong residential activity in November. 66 of the transactions were for Improved Residential properties (up from 47 last month). In an addition, all of the Residential trend-point totals are showing up green. The upper end residential market was very favorable in November, as you’ll see in the Price Point summary and by the highlighted sales below. Bank sales are also up this month with a total of 15. 11/29/2011 $2,475,000 Robbins Subdivision Lot 117 aka 0674 Steamboat Boulevard – 5 Bedroom 6 Bath YOC 2007 with 7,305 SF Living Area on .60 AC Land. PPSF is $338.81. 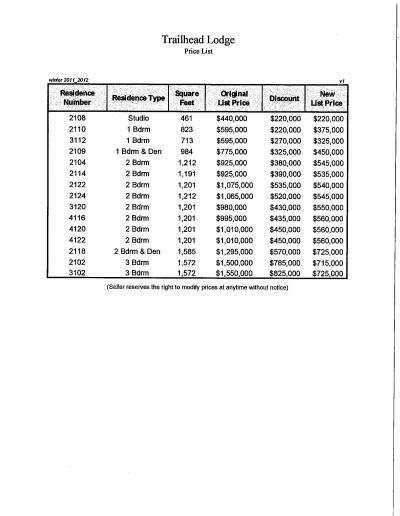 Trailhead Lodge releases winter 2011-2012 price list with huge reductions in the Steamboat Springs real estate market. Some of these units have discounts greater than 50%! The snow is flying here at the Steamboat Ski Area and opening is a few days away, so now is the time to snap up the current bargains. Paying up to 3 percent of the final sales price toward the buyer’s closing costs for initial offers received between Nov. 15 and Jan. 31, 2012. Escrow must be closed on or before March 15, 2012, to qualify. For more information on the HomeSteps Winter Sales Promotion, visit www.HomeSteps.com or contact me. October is a mixed bag for the Steamboat Springs real estate market: down slightly from last month in volume, and down even more in transactions - however, all of the difference is in Interval closings, which were significantly lower than last month. The residential market had a consistent and strong showing with close to the same numbers as last month, and a predominance of residential trend points that were trending higher. Also, you’ll find several upper end residential closings which are noted below. Bank sales were down tremendously, with only 6 in October as opposed to 18 in September..
10/27/2011 $3,375,000 Agate Creek Preserve Subdivision Lot 1 aka 35375 Humble Road – 5 Bedroom 5.5 Bath YOC 2004 with 8,137 SF Living Area. 7.57 AC Land Area. Price per square foot (PPSF) $414.77. 10/6/2011 $2,030,000 One Steambaot Place Condo @ Après Ski Way Condo Unit R-418 aka 2250 Après Ski Way – 4 Bedroom 4 Bath with 2,420 SF Living Area. PPSF is $838.84. This is a new construction sale that is located in the Steamboat Mountain Area. 10/12/2011 $2,155,000 Werner Ranch Subdivision #3 Lot 2 – aka 34225 State Highway 131 – 4 Bedroom 5 Bath YOC 2008 with 4,199 SF Living Area on 35.020 Acres of Land. PPSF is $513.22. This sale is located in the South Routt Area. 10/31/2011 $1,500,000 One Steamboat Place Condo @ Après Ski Way Condo Unit R-103 aka 2250 Après Ski Way – 4 Bedroom 4 Bath YOC 2009 with 2,384 SF Living Area. PPSF is $629.19. This is a new construction sale that is located in the Steamboat Mountain Area. Why can’t it be this simple? Q: Do you have a job? Q: Do you pay your bills? Banker: OK borrower, your self-employment status concerns us, but we have looked at your credit score of over 750 and have determined that by giving you this new mortgage at around 4% and the fact that you are currently paying between 6 and 9 % on 4 mortgages, that you are a safe risk. We think that if your payments are less than you are currently paying now, you will continue to make those new payments because they will be less. Therefore, we will refinance your 4 loans into one or 2 loans at a much lower rate. Me: So why can’t I refinance then Mr. Banker? Banker: Well, it’s not that simple, see you are self-employed and we have looked at your tax returns for the past two years and have determined that you just don’t make enough money to guarantee us that you will continue to pay your bills. Me: But I do pay my bills! You see that by looking at my credit score right? See, no missed payments. And I make pretty good money, just lots of deductible expenses because my costs of doing business are much higher now and I had some unavoidable medical bills, and my kid costs a lot. Banker: Well you have too many bills like those medical payments, child care, car payment for your business, high utility bills because you live where its cold in the winter etc. Your debt to income level is just too high, we can’t refinance you. Me: Yeah, lots of bills, that’s why I’m here asking for help. My thought is, if you refinance me at say 4%, that will reduce my monthly mortgage payments from $2000/month to about $1400/month. Doesn’t that make sense that I’m low risk? I pay less with my new loans than I pay now and then I have $600/month to pay toward my other bills? And the best part is, if I want to sell my house I have some equity built up and go buy another house that costs less now than it did 6 years ago. What da ya think? I just have to ask why can’t it just be that simple? If you currently pay your bills and you want to pay less each month with a new lower mortgage payment, you get a new loan. Many believe we need to fix the economy and the housing market will fix itself. I believe we fix the housing crisis and the economy will fix itself. is, what if we are not under water on our mortgage, have a job, and pay our bills? We want to borrow some of this cheap money too. The solution seems so simple - remove the obstacles as the Times article says. Loosen up on the debt ratios (because everything costs more these days) and bet on our past performance. I think you’ll see a lot of people in my situation who can and do pay their mortgage and bills, but can’t do so under the current tightened lending rules because our debt/income ratio is too high, or we are self employed and our tax returns just don’t fit the mold due to our deductible business expenses. Until we meet in the middle somewhere between what lending standards used be and what they are now, I see a slow national recovery. I’m thankful that our Steamboat Springs real estate market is local and for the most part not affected by this national crisis, but that being said, there are many here in my situation who could move forward with a change in the lending practices. There is no monthly mortgage insurance! There is an upfront funding fee that varies from 1.25% to 3% depending on service, down payment and prior use of the VA product. This fee can be financed into the loan. A certificate of eligibility or form DD214 is helpful for the borrower to bring in when they come in to get pre-qualified. Just released in the Steamboat Springs real estate market, prices are significantly reduced to close-out Phase I at First Tracks at Wildhorse. After 35 successful sales in the past two years, only 12 residences remain. Now’s the perfect time to purchase at First Tracks with great financing options and some of the best residences still available. I often am asked which condos rent the best in the Steamboat Springs real estate market. This is usually answered simply and overwhelmingly with ski-in ski-out. However, rental income for a ski-in condo will vary depending on the condition of the residence. A newer or recently renovated condo within walking distance to Steamboat skiing will cost much less and see higher rental revenues than a fixer-upper ski-in condo. I’ve had a couple of owners of slope-side condos recently state they barely covered their home owner association (HOA) and resort management fees last two seasons. This is due in part to the slow economy and increased inventory from a building boom in 2007, but is also due to the price point and the condo rating. Price conscious travelers in many instances are opting for a Trappeurs condo, such as Emerald or Bear Lodge, because they can get higher quality and another bedroom for the same price. Bear Lodge is about 2 blocks East of Gondola Square. At times, a 3 bedroom will rival the rental price of a 2 bed ski-in. Patio units with private hot tubs are popular as well. The quality finishes and convenient amenities like pools, hot tubs and fitness rooms add value. Many travelers will choose to walk a block to skiing for a 4 star or A-rated experience. A trend we are seeing near the slopes is older buildings taking on a new look. The West and The Phoenix, both within walking distance to the slopes, have beautiful new exteriors. The assessments were steep, but the payoff of the HOA special assessment (if not paid by seller already) can always be negotiated in a contract to purchase. 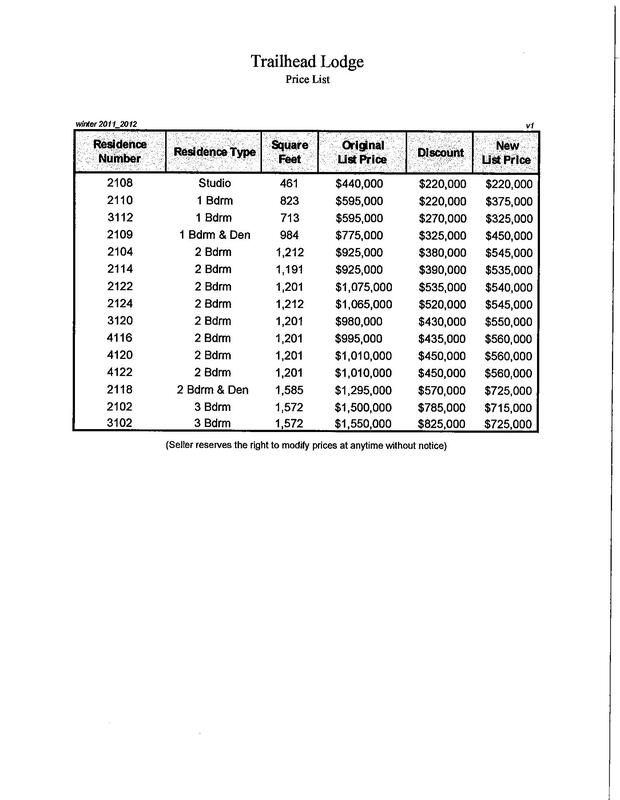 For example, many condominiums at the West could use kitchen upgrades to boost rental demand; regardless, a studio condo netted an income after HOA fees, management fees and taxes. Depending on your personal use, its typical to see rental incomes offset those carrying costs before your debt service. Prices are around 20 to 40% off our high sales in 2007. Several condominium developments within walking distance to Steamboat’s Gondola Square and ski slopes are worth investigating before the winter sales season because they may be new, newly renovated or show consistent rental revenue from good management and marketing. Under $500,000 look to are The West, Phoenix and The Lodge at Steamboat. Over $500,000 but under $1,000,000, and for more bedrooms, look to Emerald or Bear Lodge at Trappeurs. If you don’t mind a short walk to the slopes and rental income is important to you, look past the slopes and you will certainly find more bang for your buck without sacrificing convenience. Contact me for more information today.